Returning to San Francisco’s Center for New Music for their first concert of 2018, sfSoundGroup presents an evening of experimental and open form compositions with guest composer/performer Dan Joseph. The program will include the late Pauline Oliveros’ classic text score Earth Ears, Joseph’s Notes & Queries, selections from Los Angeles based composer Michael Pisaro’s harmony series, and sfSound’s own Tinnitus Insect Volume Knobs project. 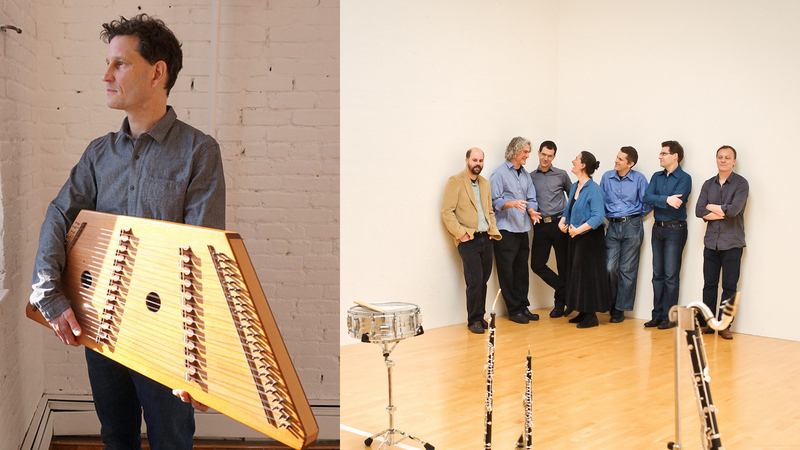 Appearing in the Bay Area for the first time since 2014, Joseph will perform on hammer dulcimer, with musicians of the sfSoundGroup including Diane Grubbe (flutes), Kyle Bruckmann (oboe/english horn), Matt Ingalls (clarinets), John Ingle (saxophone), Tom Dambly (trumpet) Erik Ulman (violin, Monica Scott (cello) and Lisa Mezzacappa (bass). Dan Joseph is a composer, performer, writer and curator based in New York City. For the past fifteen years, the hammer dulcimer has been the primary vehicle for his music and he is active as a performer with his own chamber ensemble, The Dan Joseph Ensemble, as well as in various improvisational collaborations and as a soloist. He produces the monthly music and sound series Musical Ecologies in Park Slope, Brooklyn, and is a contributing writer to The Brooklyn Rail, Musicworks Magazine and NewMusicBox.org. In 2017, the venerable New York based new music label XI Records released a 2 CD retrospective of his electroacoustic and mixed-media works titled Electroacoustic Works.